The Minnesota State Fair is one of my favorite times of the year. I love everything about the fair from the donuts, to the roasted corn, and last but not least to the people watching. The fair is fun on a stick. It is almost a right of passage for every young Minnesotan to work at the fair and for every other Minnesotan to visit at least once a year. It is one of those magical places where you can go and be who you are and eat fried foods without judgement. Okay, maybe a bit of judgement, I mean really, did you wake up today and think today is the perfect day to wear my utility kilt. 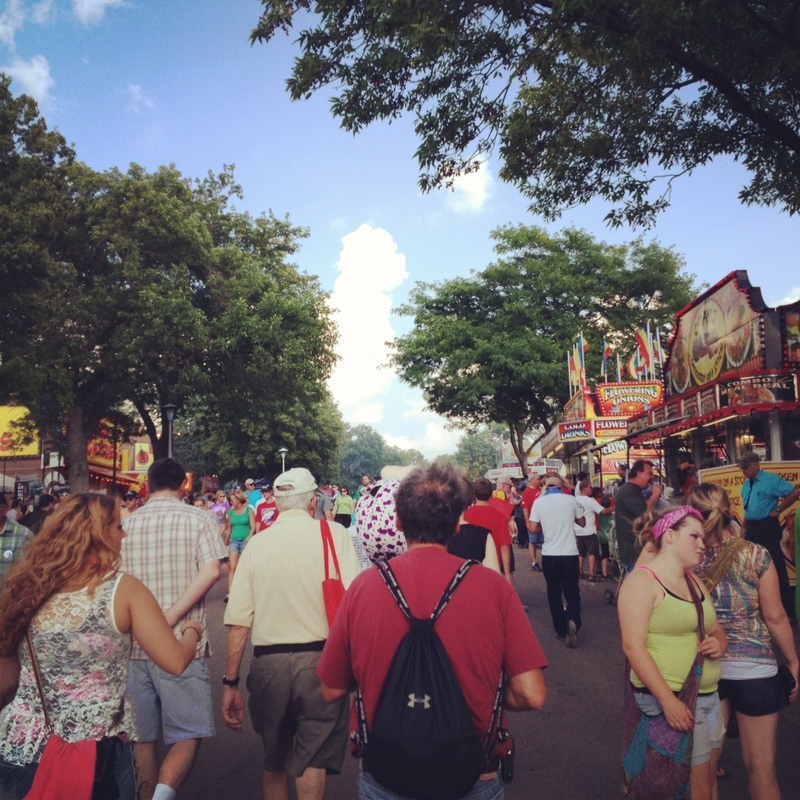 Each fair-goer has their favorite things to do and eat at the fair. These are my favorites. Deep Fried Candy Bars are always on my list of must haves. 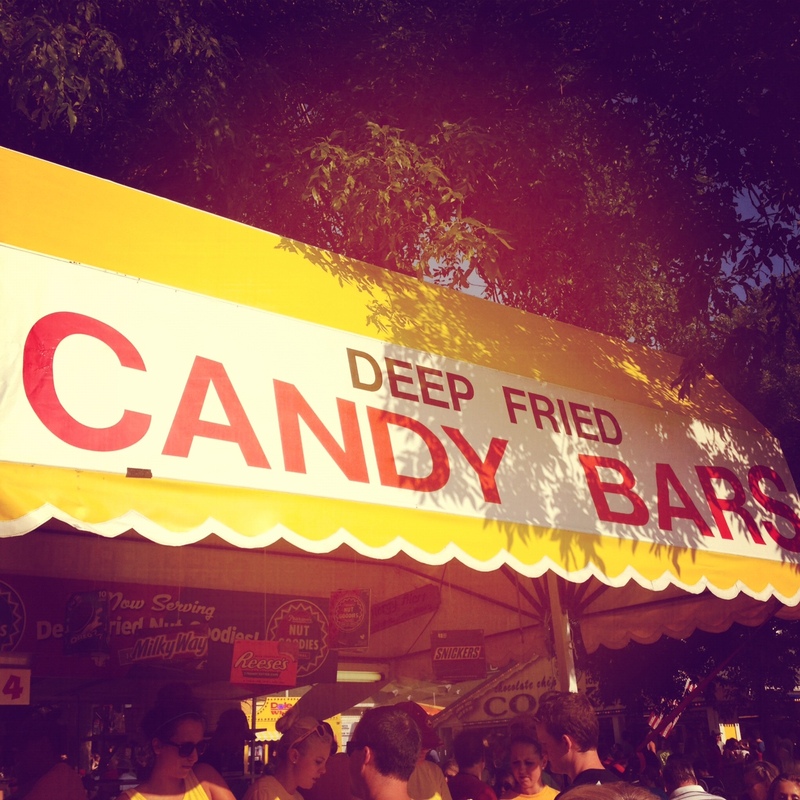 They are a great way to dive into the fried world that is the Minnesota State Fair. Warning: these are very rich! I would only get one to share for 3 people. This is a deep fried Reese’s Peanut Butter Cup. The breading is fantastic and fried to perfection. The inside is gooey, peanut-buttery, and chocolaty. 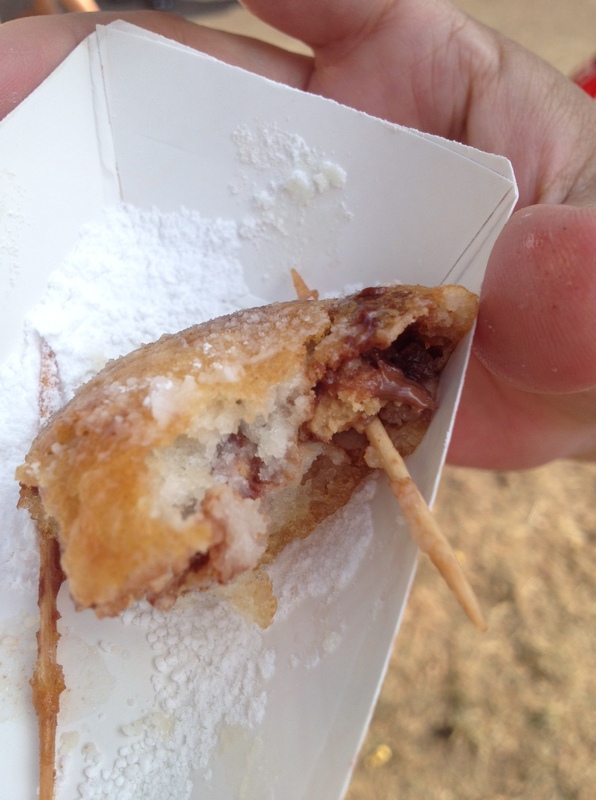 I usually get the deep fried Snickers bar which is equally as good, if not better. I would avoid the deep fried Oreo’s. They are just not as good because they don’t melt like the other candy bars. Although, you cannot eat the food on display. 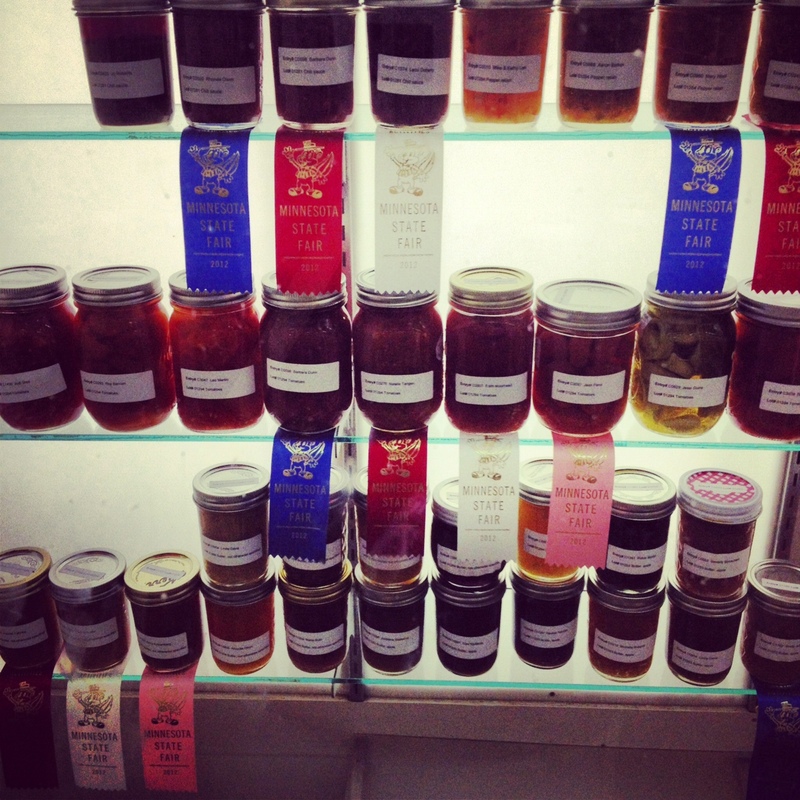 I love to go to the Creative Arts building to check out the prize winning foods and crafts. I am someone who believes in the homemade local foods movement and want to learn how to can food myself. It is amazing what some people can do. 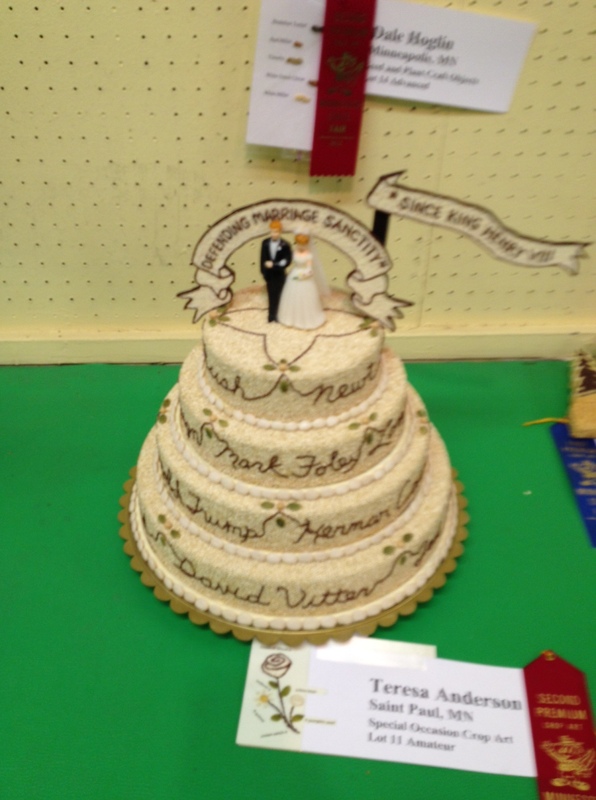 It is my goal to at some point in my life win a baking ribbon at the State Fair. It would be even more kick-a** if I could win with a Vegan cake. It looks like I have some pretty stiff competition. 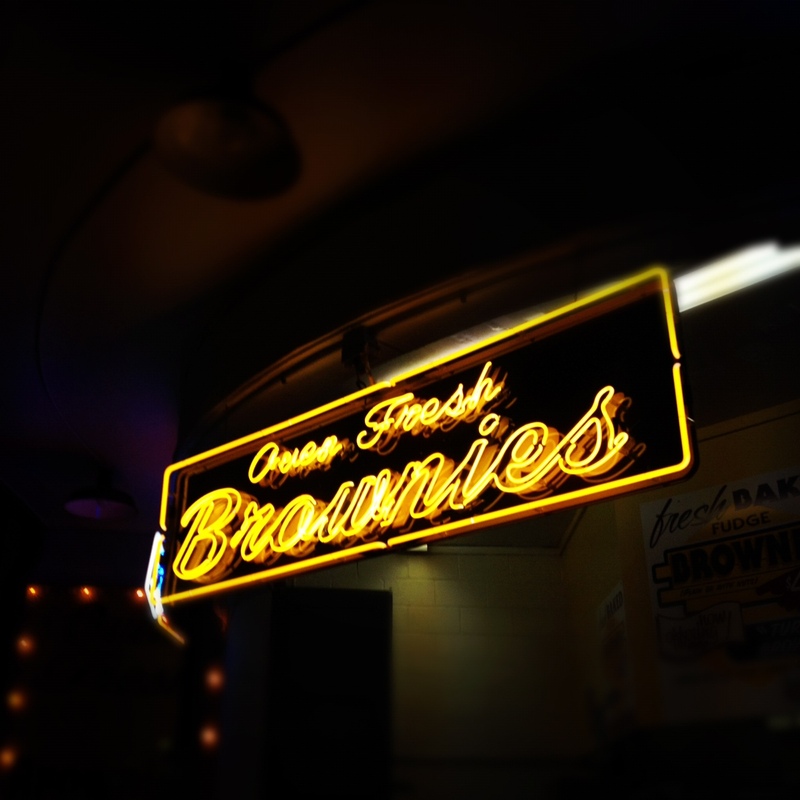 Need some “real” food at the fair? Try Giggles. It is the “La Belle Vie” of the Minnesota State Fair. This year their new food item is the Walleye Roll, which is pictured above. 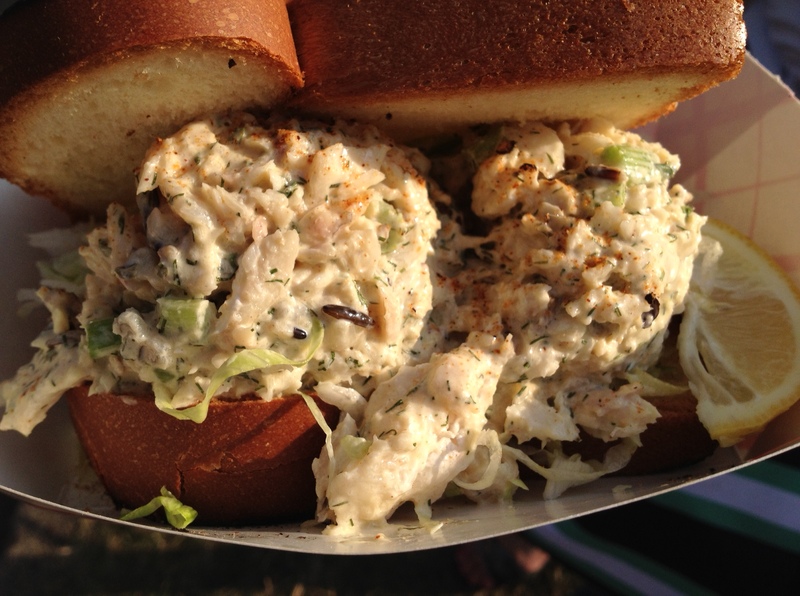 It is walleye mixed with mayonnaise and wild rice on a buttery brioche with fresh shredded lettuce. They also serve up other great items like the elk burger and walleye cakes. 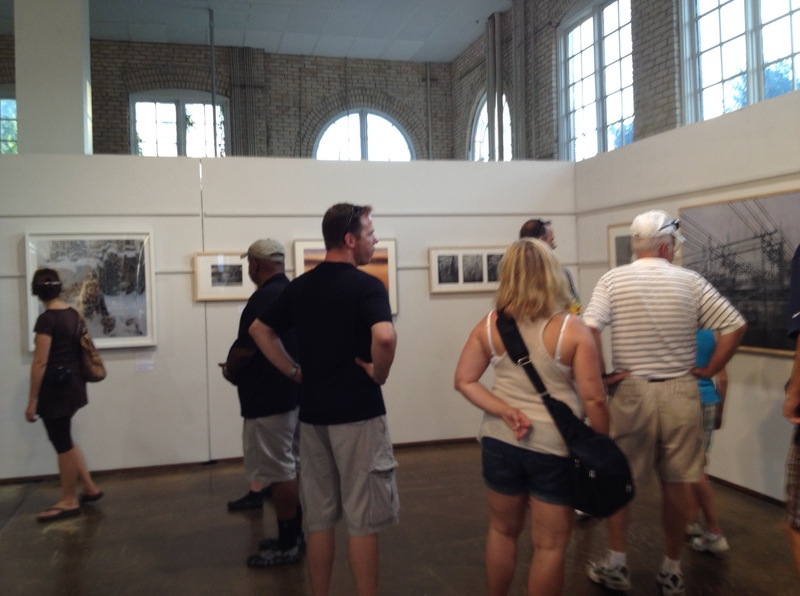 You have to go and see the crop art in the Horticulture building. Many this year were political. I got a few good laughs from this cake which says, “Defending Marriage Sanctity” and then has names of several politicians who have had some “trouble” in their marriage. It was all decorated with seeds. Also, stop by the Minnesota Craft Beer section as well. It is new this year and serves craft brews by some of my favorite breweries like Surly, Harriet Brewing, and Boom Island. All of this eating made me thirsty. Thirsty for some local wines. This was a great new addition to the fair this year. Right outside the Horticulture building you will find Minnesota Wine Country booth. 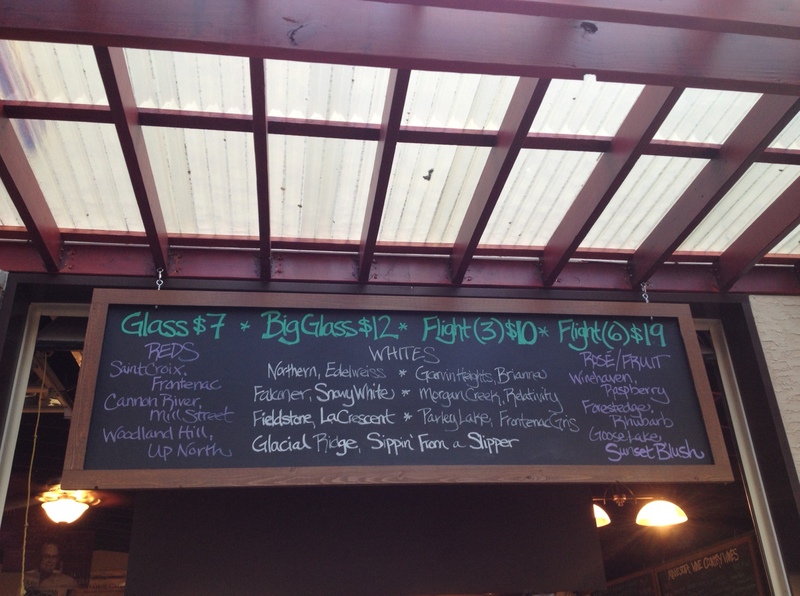 It is simply beautiful and it offers flights to try many different Minnesota wines. It even comes in the shape of Minnesota. 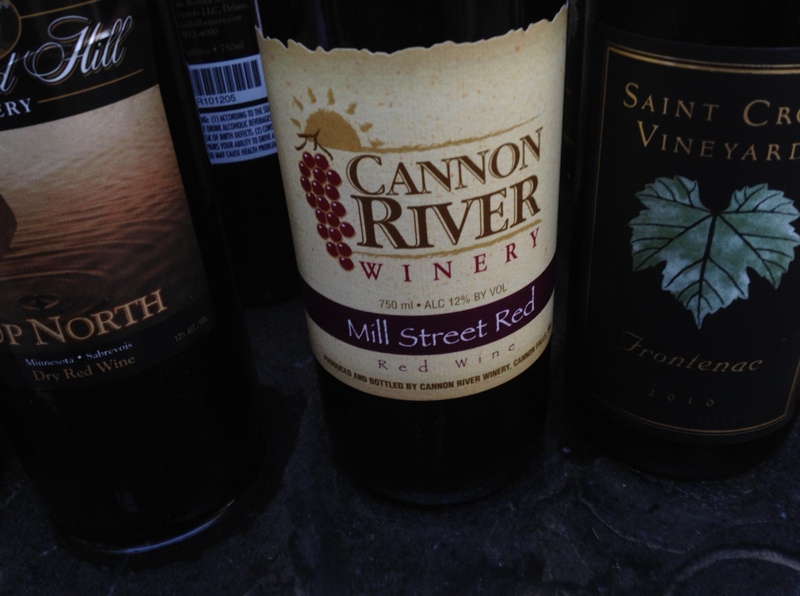 The Cannon River Winery had my favorite red wine with the Mill Street Red. The Minnesota Wine Country booth also had food available. I didn’t have any but the people around me looked like they were enjoying themselves. If you need to cool off, you should head to the Fine Arts Building and the Eco Experience building. They are free to go in and usually there is some pretty neat stuff to see. Time for more food. 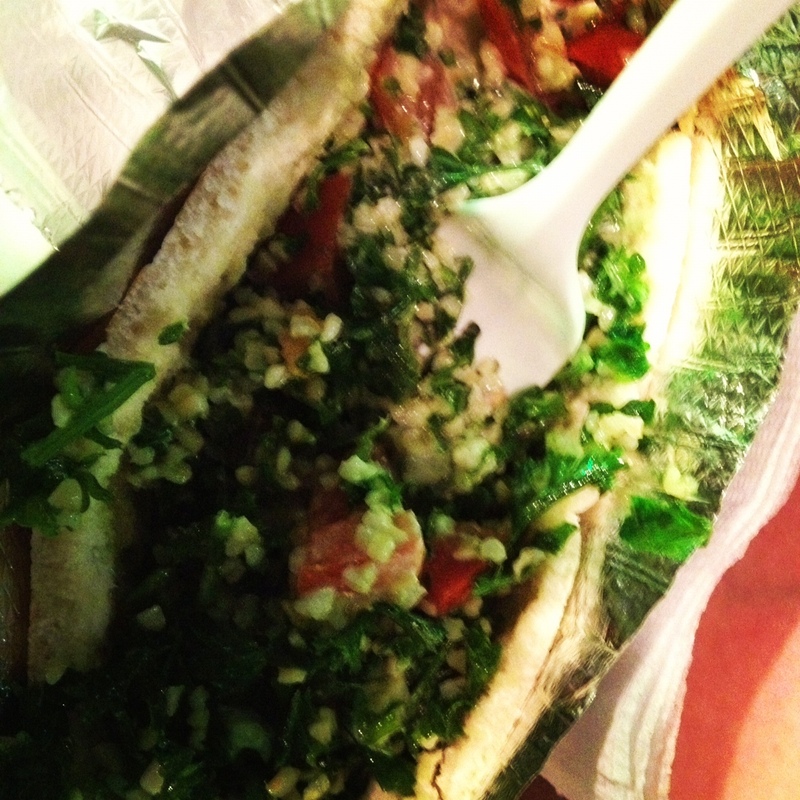 I wanted something healthy with some greens and choose this tabbouleh from the Pita truck it was delicious with the garlic sauce. It is outside the merchandise mart. 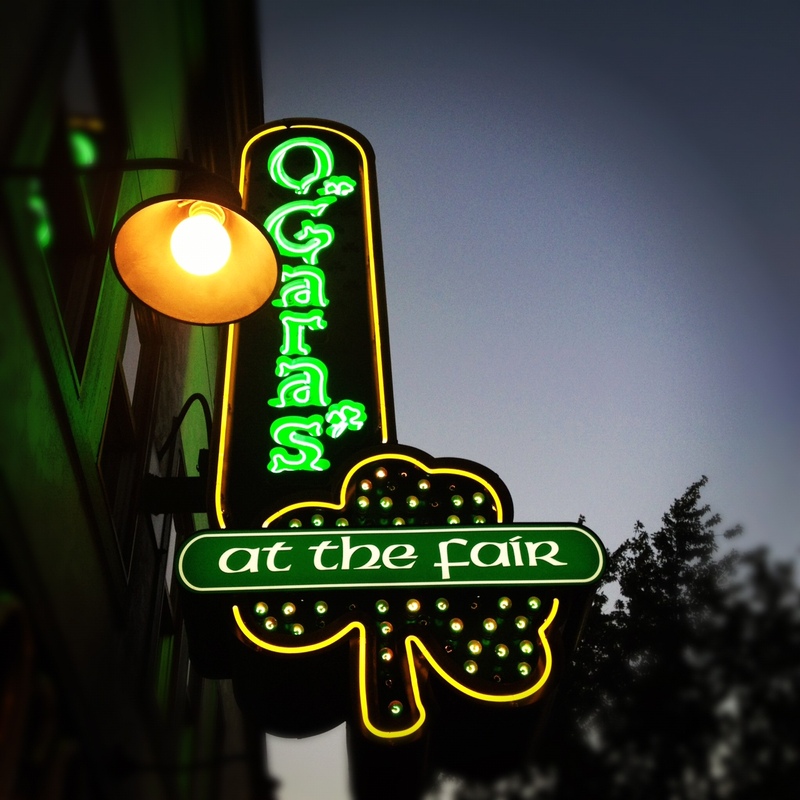 O’Gara’s is my favorite place to people watch at the fair. They have lots of tables outside and some inside as well. They usually have live music and during hot days the roof mists you to keep you cool. They have beer and a great food selection. I love the tater tots and the air conditioned bathrooms. Last but not least, I had to have a final snack as I was leaving. Because our state fair is the best state fair, don’t miss it, don’t even be late. 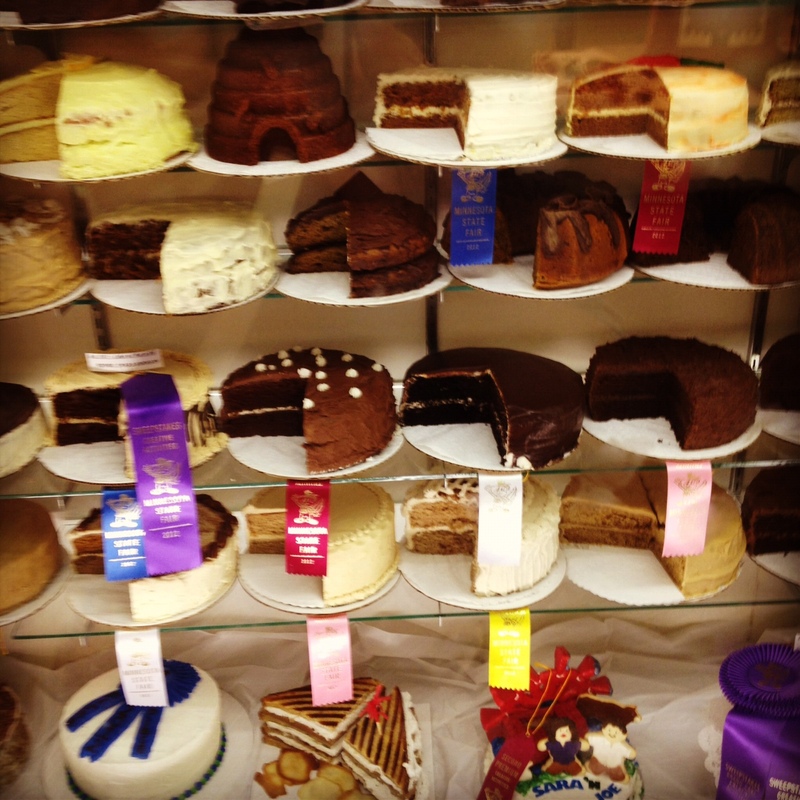 What is your favorite food at the fair? This is a wonderful post for us Fair lovers in far off places that can’t return this year.